Pilates is not simply a random choice of exercises. It is a method of movement that can enhance your physical strength, flexibility and co-ordination. It is a gentle way to tone up your tummy muscles and ease those aches & pains associated with a hectic life style. By working your body's central core, it will become stronger, more flexible and ultimately improve your physical & mental well-being. 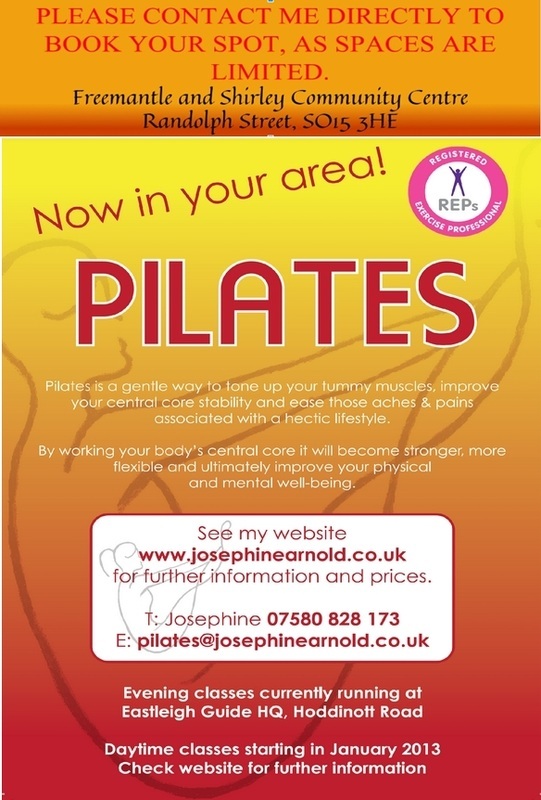 Pilates exercises will help ensure that your movements through out the day, are completed safely and in the best manner for your body. We all know that we should bend our knees to lift a heavy package, well Pilates takes your knowledge of the body's movements that bit further. Please see the Studio Times, for classes in the Southampton and Eastleigh area and contact me by email or telephone to book your place, as studio spaces are limited. If you prefer 1-2-1 sessions in the privacy of your home, please contact me to book the available time. Pilates is practiced in stocking feet. You can reach me at 07580 828 173. You can also contact me by email at pilates@josephinearnold.co.uk. Looking forward to hearing from you.